Connect with more than 700,000 agents across the top Multiple Listing Service networks. What are you waiting for? Support your agents with RatePlug’s open house flyer system. With RatePlug’s open house flyer system, you make it easy for home buyers to understand what they can afford. When you display your rates on an agent’s MLS listings, home buyers are more likely to qualify for a loan. • Engage active buyers. RatePlug connects the agent and originator to the MLS and the home buyer who’s is ready to buy – not just browsing. • Passive buyers become active buyers. 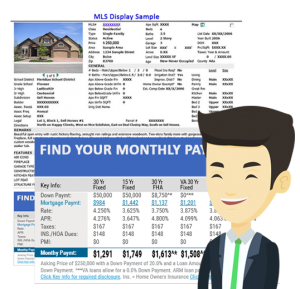 When you connect your rates to MLS listings, you leverage the reach of the MLS and reach active buyers. • More time on ​listings. When your rates are embedded in MLS listings, homebuyers spend more time viewing the listings and increase exposure for your business. • More speed. Why waste time? Property flyer system generates customized property fliers right from the MLS in less than a minute. • Easy compliance. All interactions between lenders and agents are archived for 10 years. RatePlug is fully FTC-MAP, TRID, RESPA, and TILA compliant.